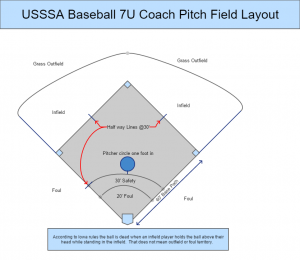 The USSSA 7U Coach Pitch Baseball field is marked differently than a regular diamond. Several of the lines are for player and coach safety. The other lines are for 7U baseball specific game play. Below you will see a diagram of the field and the line markings. 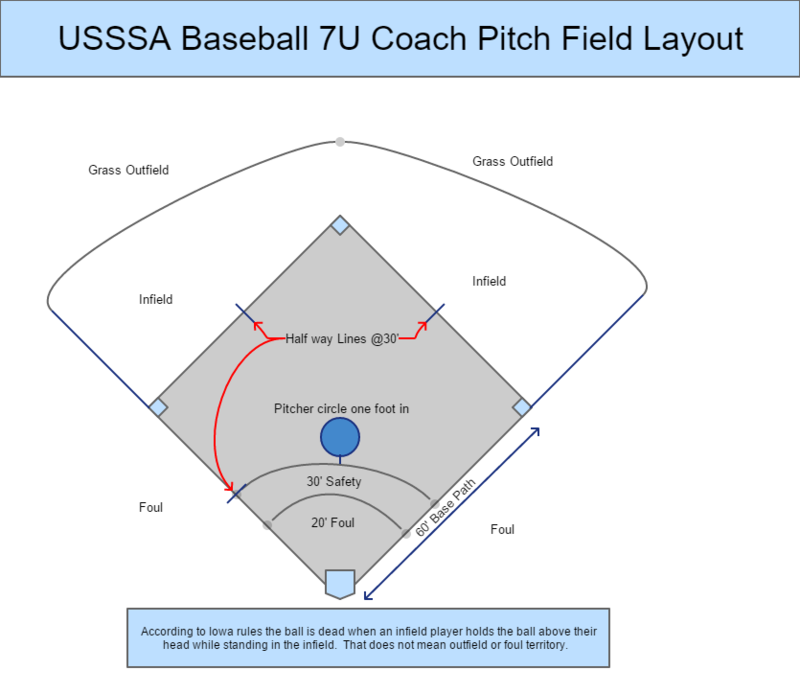 I know as a coach I always needed this diagram to share with other coaches because most everyone coaching 7U have no experience with the game and field. I hope this helps get your team going. Check out the rest of the Hot Feet Sports 7U offerings and follow the link to our Store on Baseball Rampage for the gear you will need to have a successful season. The 30′ Safety line is the primary safety measure for players and coaches. No one is allowed inside of the line. I have personally seen line drive hits by 7 year olds that could take a coaches head off. Many of my fellow coaches have been lucky to barely get out of the way in time to avoid being hit. The halfway lines show if a runner gets to advance to the next base on a dead ball or if they have to return to the previous base. This is very important as runs can be scored this way. The 20′ arc is for foul balls. Any ball touched or stopped in this area is considered foul. 10′ pitchers circle requires that the child playing the pitcher defensive spot has one foot inside of the circle before the ball is hit. I hope this diagram is helpful to all of you coaches out there. Good luck on your seasons.